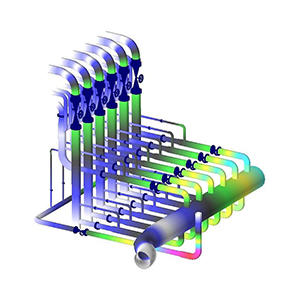 FEA-Solutions (UK) Ltd - Finite Element Analysis For Your Product Design | 071: Steel Plant Water Supply Pipe stress analysis of various sections of a steel plant water supply, subjected to loads including weight, pressure, thermal expansion and water hammer. Based on the results, diameters, wall thicknesses and supports were modified. Due to the complexity of the loads, it took up to 4 iterations to achieve a satisfactory design.